#248. Reflections (Lake Tahoe). 12 x 20, oil on canvas. "Gilbert Munger" lower right. 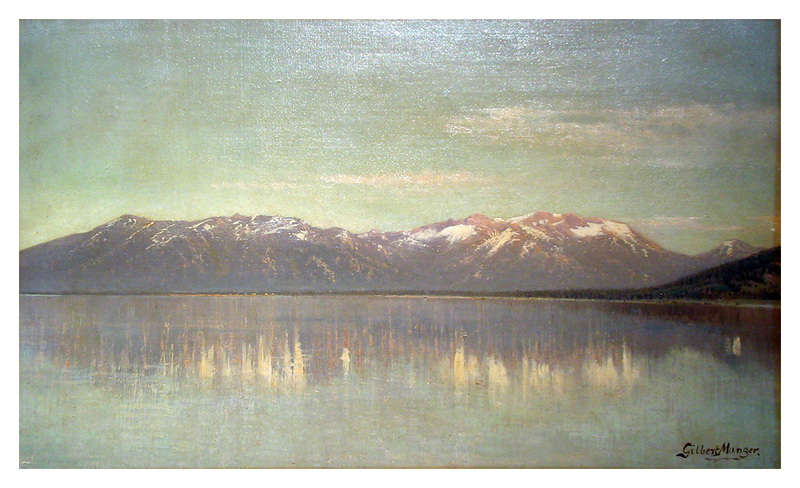 This painting shows Mt Rose and Slide Mt. (right end of the range) straddling the California / Nevada border at the north end of Lake Tahoe. 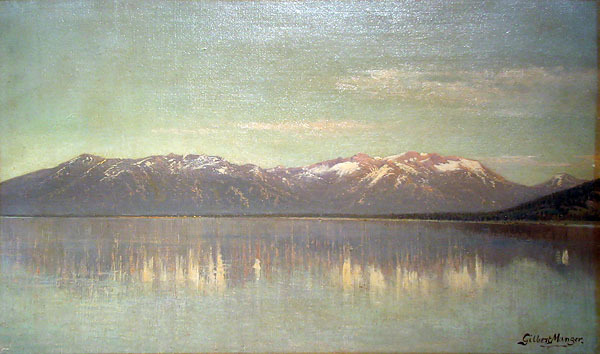 The artist is likely working from Sandy Point south of there on the eastern shore of Lake Tahoe. Historical records suggest that it was painted about 1873-4. The frame shows a maker's label from Beers Brothers, with the New York City address used between 1887 and 1899. A handwritten label says: "Munger Reflections - Lent LA Mills". This matches with a 12 November 1923 article in the Hartford Courant describing an exhibition of the paintings of the Honorable Lyman A. Mills of Middlefield CT at the Hartford Athenaeum, in which a Munger painting titled Reflections is mentioned. (See the document archive entry for that date.) The painting was identified in 2006 in Mrs. Claudette Perrin's home near St. Etienne France by her son Robert Beal. Mrs. Perrin's husband spent 40 years in the US near Brookhaven NY, starting about 1940, and the family thinks the painting came from that time. Now in a US collection. Image from owner's email.